Health care and health systems integration aim to ensure that behavioral health care services are more accessible and connected to the broader health care system. SAMHSA leads efforts to advance the recognition of behavioral health as essential to health, improve access to services, develop financing mechanisms to support positive client outcomes, and address costs. Complete your assessment and prepare to integrate your Behavioral Health systems into your Medicaid Enterprise. Each Business Area and Business Processes are defined in ReadyCert. You can also complete an assessment of the Seven Standards and Conditions. Identify and track agency goals or identified system gaps. Goal tracking at the business process level allows for better planning. 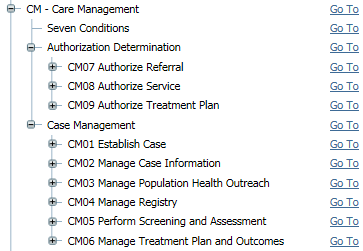 Identify and address changes in Mental Health and Substance Abuse treatment that are required by passage of the ACA. Easy coordination between Medicaid and Behavioral Health agencies allows for leverage of improvement in Medicaid Maturity to crossover to Behavioral Health. ReadyCert Certified Community Behavioral Health Clinics (CCBHCs) assessment capabilities are planned for later this year.